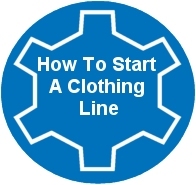 Quick Guide to How to Get Started In The Fashion Industry as a fashion designer or clothing line owner - with Help From StartingAClothingLine.com. Since 2004, we have been helping ordinary people (Beginners) break into the fashion industry with their own professional clothing lines through our signature fashion design and fashion business resources. Along with that, we have a host of informative articles on our site that offer help to aspiring fashion designers who want to realize their fashion dreams with success. 6 Ways We Can Help You Achieve Your Fashion Goals Below Even If You Are a Beginner To The World of Fashion! So you are ready to either start your own clothing line or you have started it already. Or maybe you just want to start designing clothing and need help with creating professional fashion sketches. Maybe your goal is to design clothing for your own fashion label. Or maybe you are just looking for clothing manufacturers to make your clothing line or effective ways on how to approach apparel retailers. In either of these scenarios or all of the above - you are at the right place! StartingAClothingLine.com has you covered. The Best Way to get started with your own clothing line is to invest in our Clothing Line Creator Package which basically covers the main essentials you will need to get your line going - How To Start It From Scratch, Fashion Design Software to Design It and Manufacturers List of Factories to Make It. 1. Are You Starting Your Own Clothing Line or Have A New Fashion Line? Need true fashion industry guidance that will walk you step by step through creating your clothing line, clothing line business plan, how to design your line, how to trademark your line without spending thousands, how much will it cost to start your own clothing line, how to send your designs to manufacturers, how to get manufacturers to make small quantities, quality things you should look for, how to evaluate a manufacturer, how to evaluate a manufacturer's lead time, getting samples made cheaply, do you need to send patterns to your manufacturer, how to effectively sell your line to retailers, setting up your e-commerce website, marketing your fashion brand etc. Our products can help any type of clothing line that you are creating. How to start a clothing line is something you won't have to ask again once you let our products guide you in the right direction. We can help you become a fashion designer today. Did you know that most clothing lines use fashion design software or a graphics program to create their designs for their fashion label? It is true. So if you are looking for a totally awesome program that you can use to design your clothing line with that is also super easy to use and creates professional sketches you have found the right software. Digital Fashion Pro is your answer to helping you become a fashion designer and illustrating your own clothing designs and ideas. 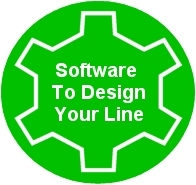 Maybe you can’t draw or maybe you can – either way fashion design software is needed if you want to present your designs to manufacturers in an approved manufacturer-ready format. You can design couture, menswear, women’s wear, sportswear, bridal, lingerie, swimwear, handbags, hats, shoes, high fashion, active wear, ready-to-wear, sportswear, couture, outerwear, urban, streetwear, sleepwear, costumes, neckties, socks, wallets and more. 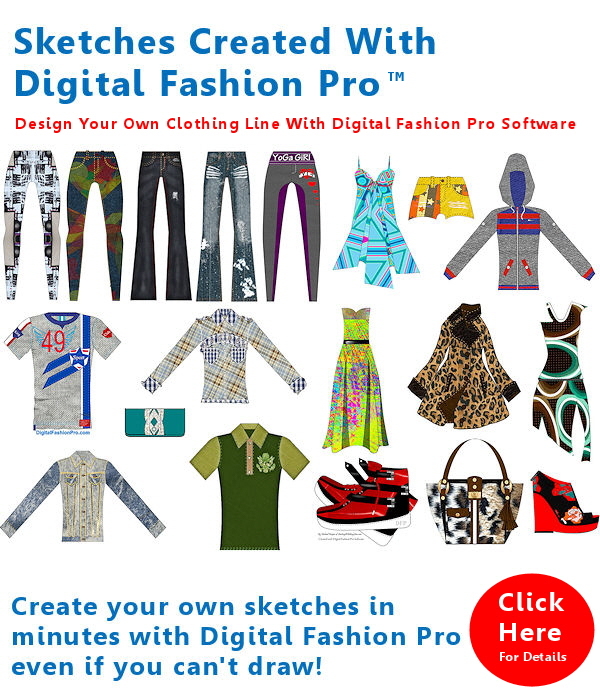 Start creating professional fashion sketches today with Digital Fashion Pro – the Fashion Industry’s number one fashion design software for clothing lines. You can be the fashion designer you have always wanted to be. * Digital Fashion Pro Clothing Design Software is perfect for the aspiring fashion designer, professional fashion designer, costume designer, someone who is designing their own clothing line, someone who needs manufacturer ready fashion sketches, someone who needs an easy to use fashion design software, fashion stylist, someone needing to create graphics for their clothing designs, fashion label's design department and freelance fashion designers. 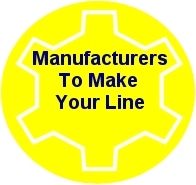 Note: We strongly recommend to anyone about to begin trying to work with any apparel factories read The Official Step by Step Guide to Starting a Clothing Line. You will be glad that you did. Trust us! Here Are Our Get It All Packages! A. Get Our Clothing Line Creator Package – Get the primary things we offer in one discounted bundle. Covers everything from how to start your own clothing line, Digital Fashion Pro Fashion Design Software to make it, Ultimate Fashion Contact List of Manufacturers that can make your line, Fashion Business Center for creating your spec sheets and more. We also offer design services. Visit Sourcing at StartingAClothingLine.com for details. Still undecided on which package is right for you - See Our Compare Packages and Features Page.